After three days circling the island I arrived at Mataram’s beach brother — Senggigi. I rented a room with breakfast — vegetarian omelette and banana pancake (how inviting) — where I stayed one night. Senggigi’s main strip consists of craft shops, featuring looms and wood carvings, as well as a string of empty restaurants and bars. Looks like this place is really struggling to get some attention. Which is funny because Senggigi is supposedly the main tourist destination for people going to the Gili Islands, on volcano hikes, to waterfalls or elsewhere. It offers a “nice” beach (don’t know, never saw it, and don’t care as I had already seen loads of nice beaches recently) and tour agencies. I walked down the main road which runs parallel to the beach, declined on the “Hey mister, Rinjani tour, you want?” offers, had some dinner and went to my room. The local food was cheap and music played everywhere on the streets, attracting foreign customers. 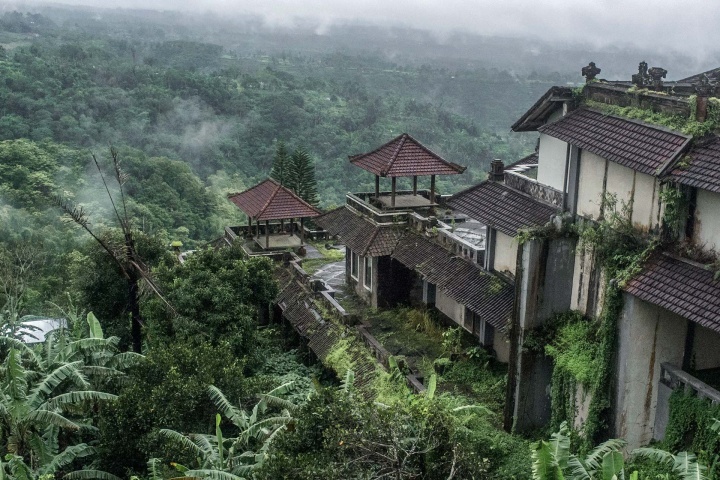 The next day I had my inclusive breakfast and began my explorations in the town centre, away from the beach and its hotels (the first ones built in Lombok), constructed in the mid-1980s. In the daylight the town’s true “beauty” is revealed and it looked like a dump (forgive me my honesty). Not sure why people praise this place so much, but thanks to my gut, as I arrived here in the evening, it doesn’t warrant more than a short stay. Now I understand why people come here only for a bit. 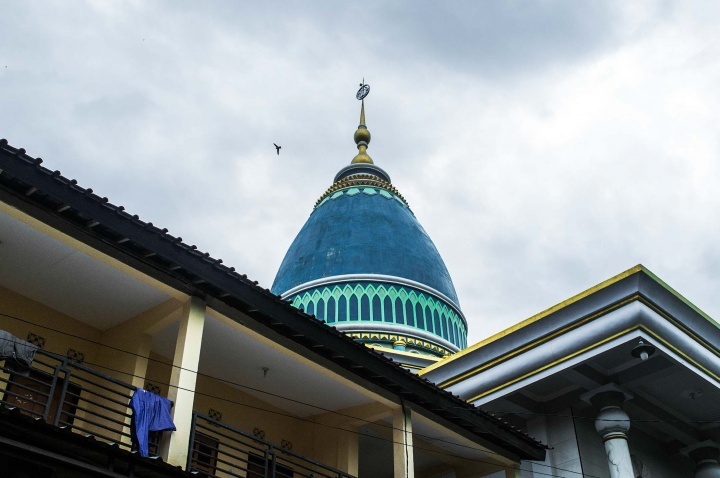 Senggigi mosque's cone shaped roof. The mosque is surrounded by hotels. I was going slowly through the town, occasionally stopping and examining the flow of life there. As I stopped next to the mosque to take a picture of it, a car filled with school children stopped at a red light and kids poured out of the vehicle. It reminded of a video where a whole Mongolian school of 60 children came out of one minivan-sized car. School boy posing as the car drives away. The kids came to me and laughed, pointing their fingers at my beard (beards are a rarity for Indonesian men), showing two or three fingers, as they do when they pose. The light changed to green and they quickly ran inside the car as it started moving, leaving one boy behind. He was too busy posing for me. 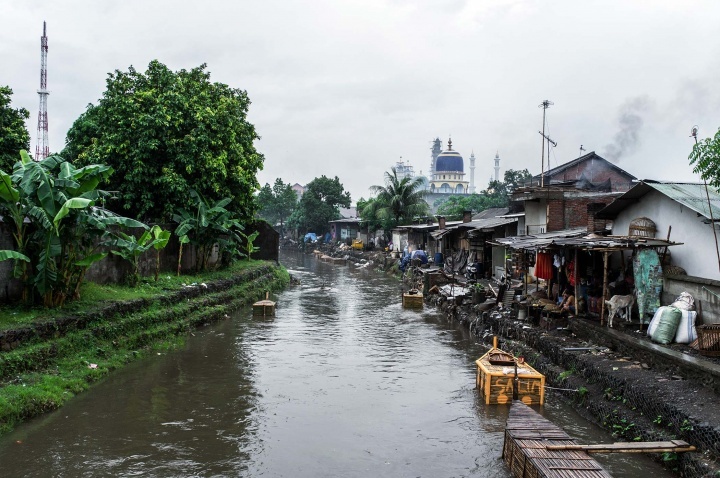 Mataram is only 20 minutes away from Senggigi and the land is divided by some rice fields, filled with snakes and enthusiasts working under rain. The rice fields here are hemmed in between workshops and food establishments and surrounded by concrete walls. This is what working in an urban environment feels like — it feels like working in a prison. 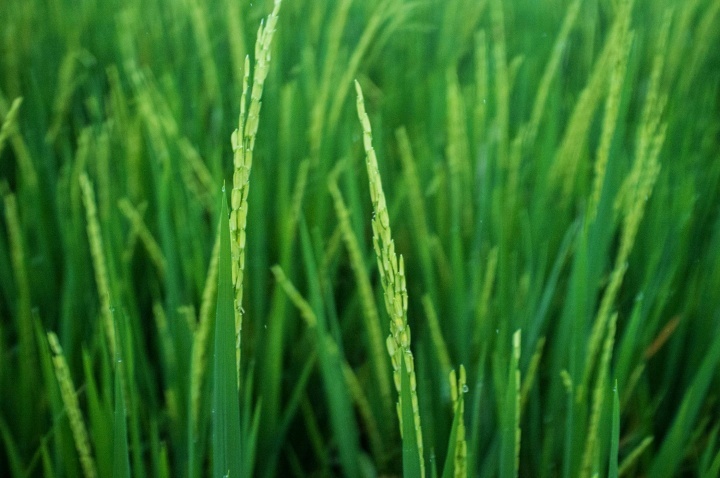 Man works in the rice field. When I was small, I thought that rice grew under the soil and had to be harvested just like potatoes and carrots. But in reality it grows outside and looks much like barley or wheat. 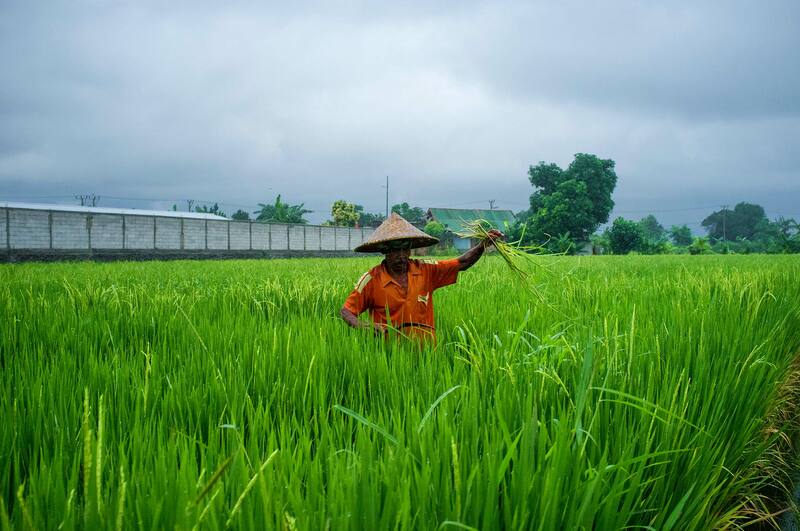 While agriculture here remains one of the island’s main income sources, Lombok generally suffers from water shortages. Similar to South Eastern Lombok the water supply in the north and west is stressed, putting the city’s water supply under strain. The water supply is sourced primarily from the slopes of Mount Rinjani and the city has a system of small dams to buffer this system. West Nusa Tenggara province is broadly threatened with a water crisis caused by increasing forest and water table damage and degradation. If this situation is not changed it’s anticipated that within years it may be difficult for people to obtain even drinking water. Productivity of agriculture will also fall. Mataram is the largest city on Lombok, there was a reason why I left it for last. It was supposed to serve as an exit point off the island. No, I don’t really enjoy large cities, anywhere in the world. River in the heart of Mataram with bamboo crates installed for fish farming so that they follow river’s flow, just like boats. Mataram residents normally speak the Sasak language, the same as most of the people on the island. Bahasa Sasak is the native language of the indigenous people of Lombok, but body language is a universal form of communication. When I formed my hands into the shape of a camera, brought them to my face and moved my finger as if shooting an image the woman nodded positively. Woman with vitiligo wears a towel on her head. Sadly I speak neither Indonesian nor Sasak, as I would have liked to ask that lady a few things. I bought some water and moved along. As I rode through the relatively clean main road, I decided to move off to the smaller side roads for a change of scene. 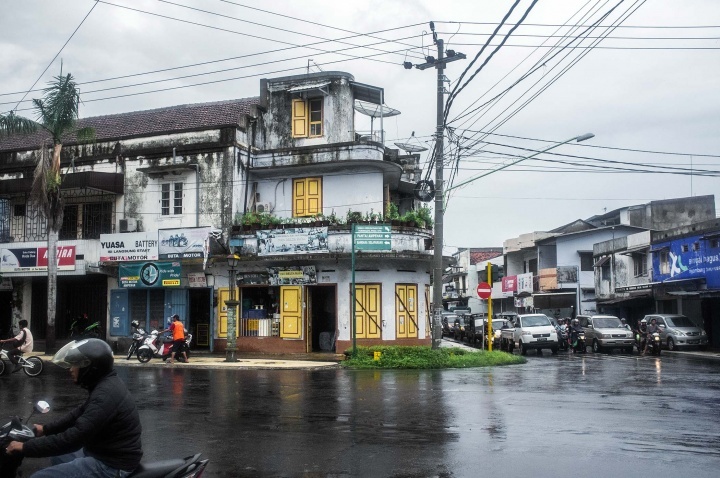 These roads are mainly narrow and muddy; they serve residents and small transport to the narrow patios that run alongside the roads and where locals live, work and walk. They are perfect for those who wants to get more of an insight into the lives of Mataram’s residents. These roads are too narrow for large vehicles, they serve for small transport and cidomo. Cidomo are a popular horse cart mode of transport used in Lombok, especially in places like the Gili Islands where motorised traffic is prohibited, also like Gulangyu Island in China. The name Cidomo is derived from the Sasak — (Ci) cikar, a traditional handcart, (Do) dokar, Balinese for pony cart, and (Mo) mobil, the wheels used to move it. Which makes perfect sense as the carriages look as if they were made up from random parts by the driver himself. Mataram doesn’t have lots to see, so these carriages are primarily used by the local middle-class, to get to mosques, markets and restaurants. Ampenan, Old Town, Mataram, Lombok, Indonesia. It is a sub-district in the city of Mataram. This area was once a central city and major port on the island of Lombok. One problem with the cidomo is that it’s very slow and is partly responsible for creating traffic congestion in towns. 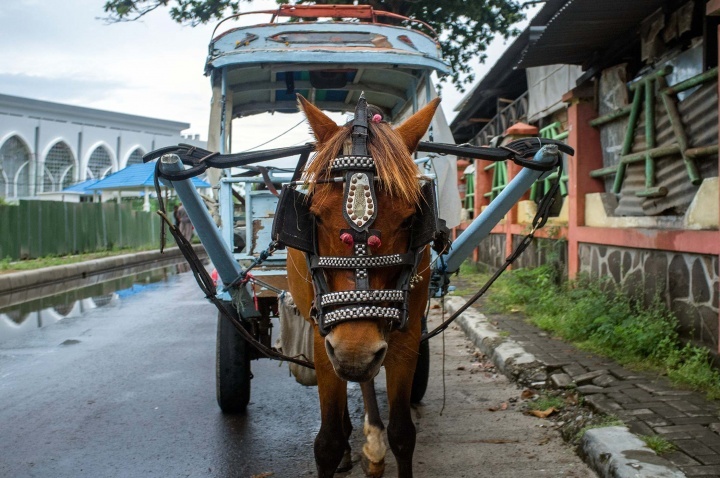 Faeces from the horses also poses an environmental problem in the towns and cidomo drivers have been urged by the Indonesian government to clean up after themselves or face suspension. This threat has pushed them to use dung bags at the back of the horses. Interestingly, as herbivores, horses have a panoramic view, as their eyes are positioned on the sides of their head. In an urban environment, filled with many distractions for the animals, they can panic, resulting in injuries and even fatalities. To prevent this happening, the horses are given blinkers to keep them from being distracted or spooked, especially on crowded city streets. This has helped the horses to remain as a form of street transport for hundreds of years up to today. The horses are forced to labour in all weather extremes, evading the traffic, and pounding the pavement all day long. An animal that was once free is forced to suffer from respiratory diseases, from being stuck in exhaust fumes, and develops debilitating leg problems from walking on hard surfaces. After a horse has served its time it doesn’t go into retirement as a human does, instead it’s slaughtered and sold for meat. It’s a hard colt life. Indonesia is a one big country, it consists of thousands of islands with a population of 258 million people, 90% of which relate to 300 ethnic groups. Its inhabitants speak 700 languages and follow 251 religions, six of which are “official”. The main religion is Islam. With such an assortment of languages and religions, Indonesia’s motto became “Unity in Diversity”, which was taken from from an Old Javanese poem Kakawin Sutasoma. This motto was used for political and social movements and became popular within many other nation states, including the EU. However, for a country that prides itself on its diversity, Indonesia’s moral and religious studies certainly don’t match up. In order to promote the nationalism of the new republic of Indonesia after the Dutch and Japanese colonial rules, a new institution was created — an education that is anti-discriminatory, elitist and capitalist. 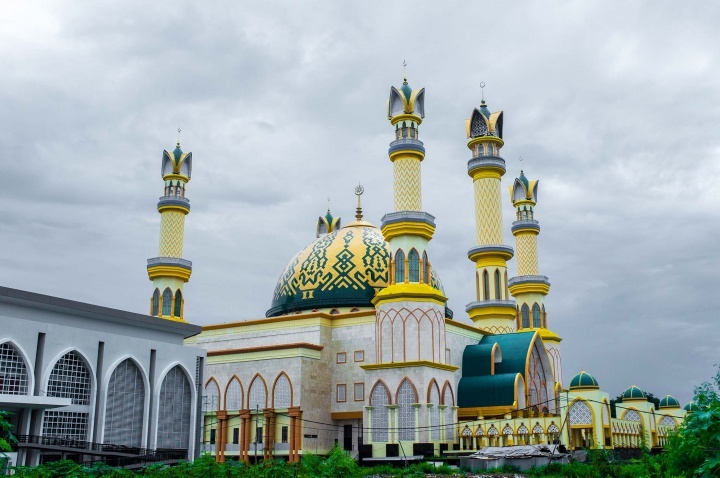 It was also decided that religion deserved some proper attention, which resulted in increased support for the Islamic Madrasa (educational institutions). Although the government confirmed six official religions, from elementary school Indonesian students are generally taught only about Islam. 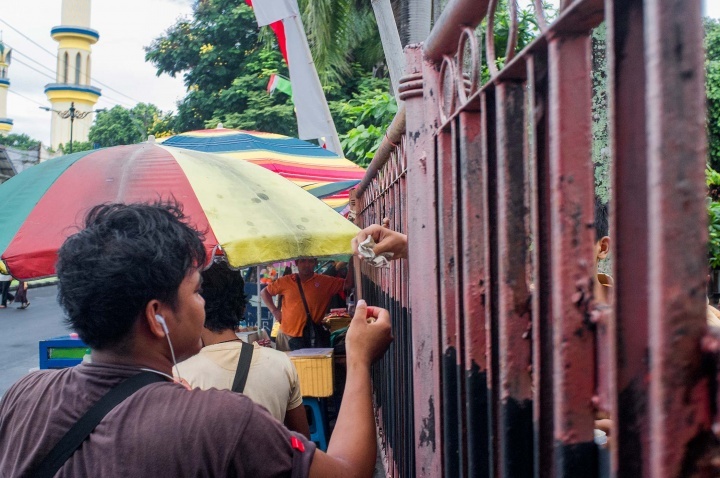 School kids buy snacks and drinks from a seller through the school gate. Similar to the west, Indonesians are required to attend 12 years of school; primary school (6 years), middle school (3 years), high school (3 years). With the only difference — the potential to study. Schools in Indonesia are run either by the government or private sectors, 16% of which are religious schools. There are 170,000 primary schools, 40,000 middle schools (×4 times less) and 26,000 high schools (×2 times less). 93% of primary schools are government-operated, public free schools, which allows most Indonesians to get a free basic education of reading and writing. Given that the number of secondary schools is four times smaller and gaining entrance to these schools is extremely hard, primary school graduates have to choose between: 1. Continuing their studies in a free public school, but with exceptional grades. 2. Going to private school for money. Or 3. Going to religious school. I was told that Islamic schools teach al quran, arabic, theological matters, nahwu shorof (a study about reading the quran properly, about how beautiful Islam is, the difference between halal and haram etc. ), sharia law, english, maths and geography. 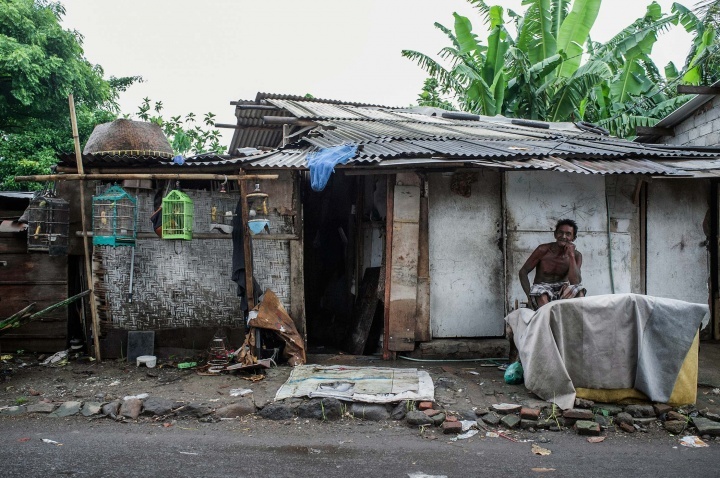 So if your grades aren’t excellent and if you don’t have money – most of Indonesians don’t – you are more likely to go to Islamic school or drop out of your studies and work as a farmer.